Poll: Do you have a motorhome reversing camera or sensors? A motorhome reversing camera or sensors will not only help making parking or pitching up easier – it could also reduce your chances of an unwanted bump or scrape. Each year we deal with many accidental damage insurance claims, which are often caused by a reversing mishap. Many could have been avoided if there had been an early warning sign from a motorhome reversing camera or sensor. In our latest community poll, we’d simply like to know if you have a reversing camera or sensors fitted to your motorhome, or if you’d consider having either fitted? Do you have a motorhome reversing camera? As always feel free to share more about the type of camera or sensors you have on your motorhome and if they have helped you avoid any damage to your pride and joy. Add your comments in the box below. Plus, don’t forget we offer a motorhome insurance discount for owners who do have a reversing camera or sensors fitted to their leisure vehicle. We’ll report back the poll results in August. I have a rear view / reversing camera and find it invaluable but nevertheless it is inadequate for reversing off the road into my narrow driveway and today I will be seeking a suitable reversing sensor kit – I don’t want the variety with an on-dashboard display, just a buzzer to alert me when I’m too close to the bits the camera can’t see. Like others, I find the camera (a Sony dual-lens) is severely affected by rain or by dazzling lights behind me at night: If anyone knows of a better camera, please post details! It is also inadequate when reversing towards a sloping bank and I have had to repair the skirt corner mouldings on each side of my Swift “Escape”. I should have let my wife guide me! If anyone has a solution to my biggest problem, again, please post it! In my small drive I have to park (behind a high hedge) at 45 degrees to the road and so I cannot see pedestrians on the pavement or cars on the road until the front of my ‘van is almost on the road. I have read somewhere of someone with a similar problem installing a rear-view camera, suitably angled) at the very front of the over-cab but the firm that supplied my system advised against it: any thoughts, anyone? I have a reversing camera on the motorhome but sensors on the car. I keep finding myself listening for the beep in the motorhome – maybe I need to have sensors fitted to it too! I find it’s not always easy to judge distance with the camera alone so often enlist the passenger’s help as well. It’s a shame they don’t work well in all lights Briann. We’ll feedback your comments to Swift. We also take a pair of walkie-talkies. In difficult situations it’s nothing like having someone on the end of the walkie-talkie to describe what is going on. How do sensors cope with the extra depth of a dual cycle carrier ? I would imagine a cycle carrier might interfere with the operation of the sensors. It’s worth speaking to your motorhome manufacturer or an electronics company which specialises in vehicle sensors. Any of our blog readers got any advice for Mike? My wife walks to the back of the camper van and helps when I am reversing in tight areas. Unfortunately my insurance company does not give me any discount for this excellent facility !!! I have both on my motorhome but also I have an integrated rear camera which is handy to see vehicles right up close.Also checks the bikes are still there. 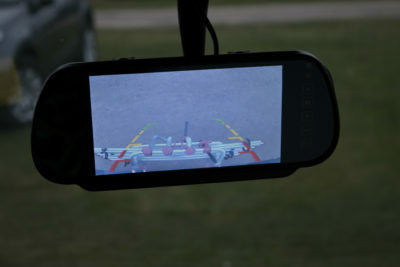 I have a dual camera setup allowing for rear view whilst driving and downwards view for parking. I also have reversing sensors with audible beep. I fitted all myself to an older motorhome and must admit i would really struggle without them! I am able to reverse park onto my awkward driveway on my own with ease now. Apart from the head unit stereo (monitor) all other items can be purchased cheaply and fitted by any DIY capable person. An absolute must in my opinion. I still manage to miss judge height now and then and catch a sign or tree branch. Any suggestions to overcome this? Hi Ben, we’re stuck for a suggestion on avoiding signs or branches. There are some 360 degree cameras now and maybe those would help. Wonder if any of our other blog readers might have ideas? My reversing camera has saved many a potential scrape. Most recently, a pitch was overshadowed by tree branches and although the way was clear to reverse, it was not obvious that the branches were too low for my motorhome. A quick glance at the monitor whilst reversing avoided a disagreement with the tree. Thanks for the comment Philip. A big thumbs up for reversing cameras! A reversing camera is a boon – we have one,but even with one there is no better way of preventing the back end saying “hello” to an obstacle than the passenger getting out and watching also. Common sense suggests anything to improve all round visibility is a good thing. Hi we’ve added the option to vote for ‘both fitted’ on the poll now. Thanks for letting us know.